The mobile app market is rapidly growing. As a consequence, user acquisition costs are steadily increasing. According to Fiksu, the “Cost Per Loyal User Index” reached $4.04 for iOS and the “Cost Per Install Index” reached $1.32 for iOS and $1.91 for Android. Taking into account constantly increasing user acquisition costs, it is vital to pay attention to organic traffic and ad performance. The first thing that has to be properly implemented is App Store Optimization (ASO) – as a free, affordable tool to drive organic traffic to an app and increase an app page’s conversion. If you want to get more information on why ASO is so important, read our guest post here. There are tons of articles on the web about App Store Optimization. However, the problem is that most of them cover only the main components of ASO without a thorough explanation of how to implement anything. 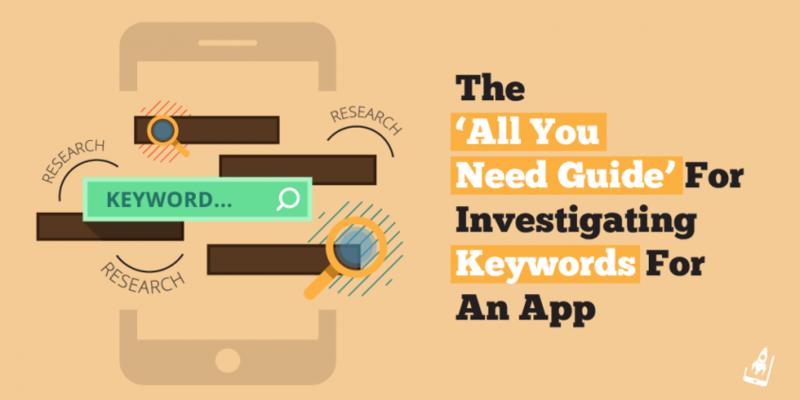 This article is an attempt to provide a step-by-step tutorial on how to investigate keywords for an app. Disclaimer: The primary purpose of this article is to provide a general approach to investigate and select the right keywords, not for specific app stores. Thus, this article can be helpful for both iOS and Android platforms. The article includes three main parts: how to investigate keywords, how to collect and choose the right keywords, and how to organize iteration cycles to maximize installs and decrease user acquisition costs per install. Keywords investigation is a starting point to collect the core semantics. There are several sources for keywords. This list can be very long if you want. But bear in mind that you are limited in time; the more sources you investigate, the more time you spend, and the less competitive you are. It is well-known that the speed and accuracy of your activities are your competitive advantages. That’s why we are fans of the Pareto principle – focus on 20% of the most important actions that lead to 80% of the final results. Taking that into account, we took onto the most valuable sources for collecting and generating keywords. Just imagine that you have generated tons of words from different sources, and what’s next? You can get lost in all of the information you have. This is a good way to start. Simply forget about everything, sit back and describe what your app is about. Even if you already have a description, write it from scratch. You can start with some general points and then describe the functionality or gameplay in detail. List all the features and necessary details about your app. The more thoroughly you complete this step, the better results you will get. What type of app do you have? What experience will a user gain after using it? What problem does it help to resolve for your user, or what objective can be achieved? As soon as you are done, switch to a description analysis. The main thing in this step is to define which keywords were the most repeated. You can define the density using free tools on the web. For instance, here is a free tool to count density: Textalyser! Review mining is one of the top sources for fetching relevant keywords. This is undoubtedly a very underestimated tool nowadays. Users’ feedback contains tons of free valuable information. If your app is not published yet, or your app has very few reviews, it’s not a problem. The best way is to find close competitors and similar apps with reviews. Fortunately, there is a choice in the app stores. In another guest post we consider three main ways to conduct review mining: 1) manual processing, 2) simple tools like Excel, 3) professional tools and services. Another important way to save time and perform better is to spy for keywords from competitors. This might save a lot of time because other app publishers have already done the legwork. Taking into account that Google Play app publishers can place keywords only in an app description, and there is no hidden keyword field like iOS has, some app descriptions are very rich sources for relevant keywords. If you investigate app descriptions in Google Play for the same genre made by middle and major players, you can find tons of almost ready-to-use keywords bundles. So, app description, review analysis, and keywords spy are the main focus for you. Do it properly. As we mentioned, we want you to focus on the main sources. If you feel that you haven’t collected enough keywords from the sources above, then you can continue your investigation with synonyms and Google keyword planner, for instance. When you are done with keywords investigation, it’s time to collect all of them into one spreadsheet and switch to the next step, which is keywords assessment. Keywords assessment and analysis is an important step to get an understanding of what you should use to get better results. The first thing we want to draw your attention to is keywords bundles. Each bundle is considered as a hypothesis for that stage. That’s because you don’t know for sure which keywords will work better. A bundle might include the keywords that refer to a certain flow or topic for instance. Why is it important to distinguish these bundles? Because long-tail keywords also matter. It means that if you collect a keyword bundle with a certain topic, there is more chance that you will be able to be visible on a store through more keywords that are formed by the combinations of keywords for this bundle. After you have defined your main hypothesis, separate your spreadsheet into groups according to your hypothesis. Now, for each group there is a need to prioritize the keywords you’ve included in these groups. Probably the most suitable free tool for that is SensorTower. They have also provided an in-depth explanation in this post. The three main indicators discussed here are: relevance, difficulty and traffic. Relevance is the most important indicator that has the highest weight. This is how relevant a keyword is to an app. If relevance is not very high, then there is no sense in the remaining indicators. Relevance can be defined by you according to your perception and feelings; mark the column with a relevance score for each keyword in each group. Then, the SensorTower tool can be used to evaluate how difficult it is to be visible using this keyword for your app and how much traffic an app can get for a particular keyword. Also, make columns for these indicators. Now it’s time to test the hypothesis. At this stage, you have to have separate groups with keywords that are prioritized according to relevance, difficulty, and traffic, taking into account that there are limits on App Store and Google Play for using keywords. Firstly, try to test each bundle on the app store. After you get the best performing bundle, then you can dig deeper into it and play around with the keywords inside. ASO is not performance marketing. You cannot measure ROI on ASO, and that’s because you can’t really measure what a change in ASO has done in terms of downstream revenue. Whereas with SEO you can A/B test, and thus calculate the increase in revenue because of a change in your SEO strategy, with ASO you can’t (yet). That said, there are various ways to go about ASO in a data-driven way. 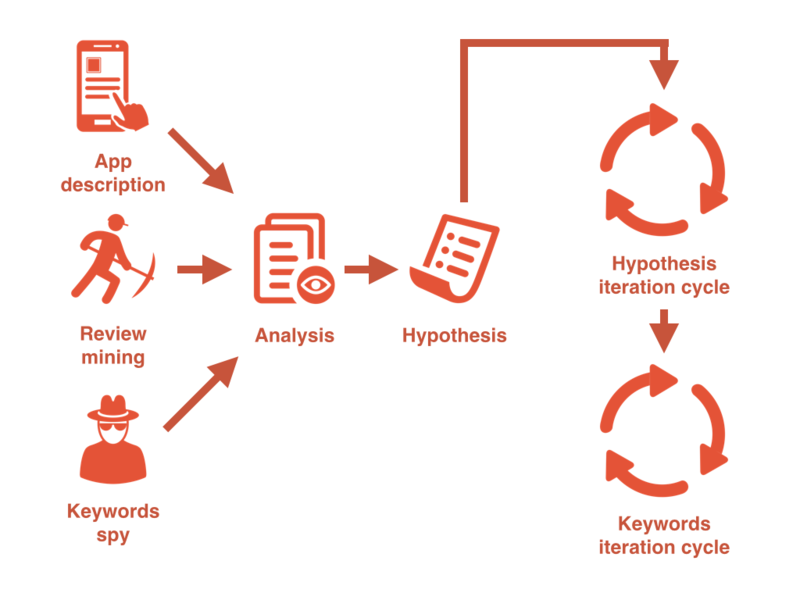 The first iteration cycle helps in defining which keywords bundle performs better. Then it is smart to focus on this bundle and conduct further tests by replacing the keywords and tracking the changes. In this article, we’ve explained our systematic approach in dealing with keywords. This is vital for your app marketing, because it is an opportunity to get more organic app downloads and increase ad performance. In a busy world, we draw your attention to the major things that bring the most results. It is always vital to define and test a hypothesis through systematic iterations. We hope you will get higher results using our approach, and you will certainly be able to adapt it in a better manner in accordance to your needs. Please be sure to share your thoughts in the comments below!